With the Big Four (Stanford, Crocker, Hopkins and Huntington) and all that, the Central Pacific Railroad Company began building East from Sacramento in 1863. They only made 50 miles in the first two years -- and that was easy terrain. The Transcontinental Railroad was completed in 1869 mostly using immigrant labor (Chinese on the CPRR and Irish on the Union Pacific). The definitive online CPRR history is at http://www.cprr.org/ The CPRR became the Southern Pacific Railroad. If you click the CPRR link above you will have to do a lot of backs, or manually return to Jerry Turns 60. 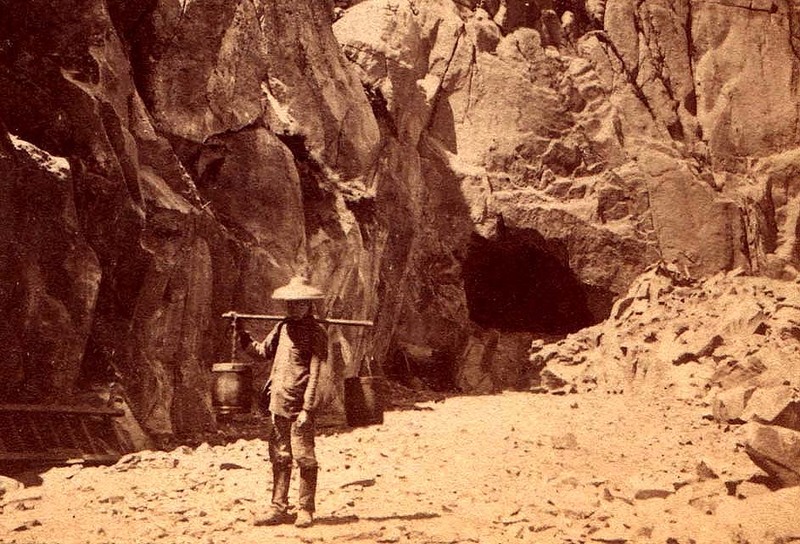 "The first Chinese were hired in 1865 at approximately $28 per month to do the very dangerous work of blasting and laying ties over the treacherous terrain of the high Sierras. They lived in simple dwellings and cooked their own meals, often consisting of fish, dried oysters and fruit, mushrooms and seaweed." Here is a Chinese railroad worker at tunnel No. 8. From an old Hart Stereoview #204. Courtesy Steve Heselton Collection. This is obviously an early photo. We will go through this tunnel.